Natural regenerating forests are rapidly expanding in the tropics. Forest transitions have the potential to restore biodiversity. Spatial targeting of land use policies could improve the biodiversity benefits of reforesting landscapes. 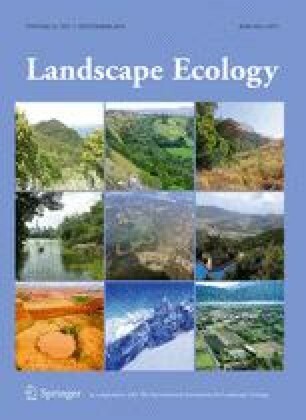 We explored the relative importance of landscape attributes in influencing the potential of tree cover increase to restore native woody plant biodiversity at the landscape scale. We developed land use scenarios that differed in spatial patterns of reforestation, using the Pangor watershed in the Ecuadorian Andes as a case study. We distinguished between reforestation through natural regeneration of woody vegetation in abandoned fallows and planted forests through managed plantations of exotic species on previously cultivated land. We simulated the restoration of woody plant biodiversity for each scenario using LANDIS-II, a process-based model of forest dynamics. A pair-case comparison of simulated woody plant biodiversity for each scenario was conducted against a random scenario. Species richness in natural regenerating fallows was considerably higher when occurring in: (i) close proximity to remnant forests; (ii) areas with a high percentage of surrounding forest cover; and (iii) compositional heterogeneous landscapes. Reforestation at intermediate altitudes also positively affected restoration of woody plant species. Planted exotic pine forests negatively affected species restoration. Our research contributes to a better understanding of the recolonization processes of regenerating forests. We provide guidelines for reforestation policies that aim to conserve and restore woody plant biodiversity by accounting for landscape attributes. The online version of this article (doi: 10.1007/s10980-016-0340-7) contains supplementary material, which is available to authorized users. This research was supported by the Belgian Federal Science Policy Programme BELSPO (Project Stereo II SR/00/133) and the Fonds National de la Recherche Scientifique (FNRS, Brussels, Belgium). We acknowledge the collaboration and hospitality offered by the communities living in the study area, in particular the family Paguay. We are grateful for the data provided by Jorge Caranqui from the Herbario Politecnico CHEP in Riobamba, Ecuador, for the contribution of Dr. Vincent Balthazar, and for the advices of Prof. Veerle Vanacker and Dr. Patrick Meyfroidt. We thank the Pontificia Universidad Católica del Ecuador and the Ecuadorian Ministerio del Ambiente for their collaboration. This manuscript was greatly improved thanks to constructive comments by two anonymous reviewers.